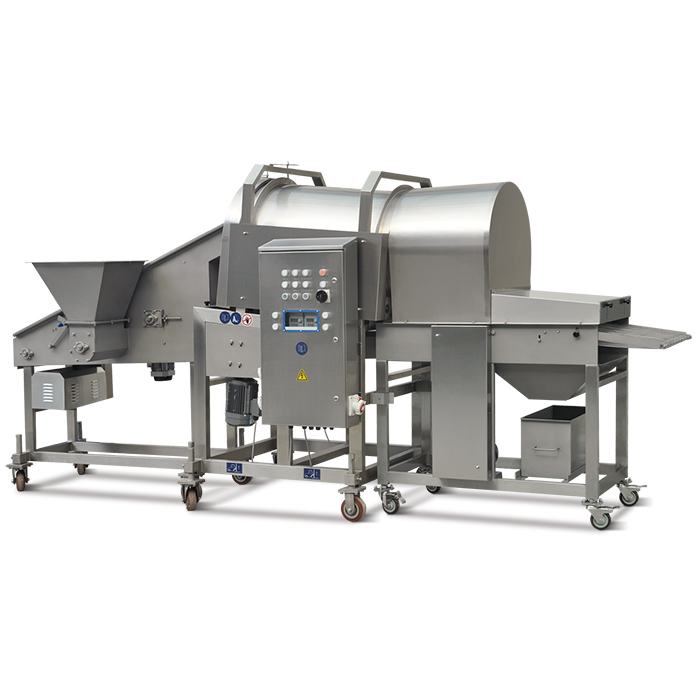 Drum breader (snowflake crumbs) GXJ600 is specially designed for snowflake chicken fillet, strips, balls products. The marinated raw material put on the lift conveyor with snowflake crumbs evenly, and transfer to the drum, the products surface can be coated with snowflake crumbs. Tumbling barrel design, the gather and concave convex parts of the meat can be coated fully. Various kinds of snowflake crumbs can be used, and coating volume can be controlled. Excellent transfer recycle system can avoid the snowflake crumbs broken and sticky. Stainless steel made and portion non-metal material, safe and reliable, in conformity with the standard of HACCP. Surface with sand blasting, brushed guard plate. Access to battering machine and fryer for a continuous production line. Drum breader machine (snowflake crumbs making machine) GXJ600 is specially designed for snowflake chicken fillet, strips, balls products. The marinated raw material put on the lift conveyor with snowflake crumbs evenly, and transfer to the drum, the products surface can be coated with snowflake crumbs. No manual separating with higher capacity.